Nat’s is the only official dealer of Trek Bicycles and Electra Bicycles in Bowling Green. 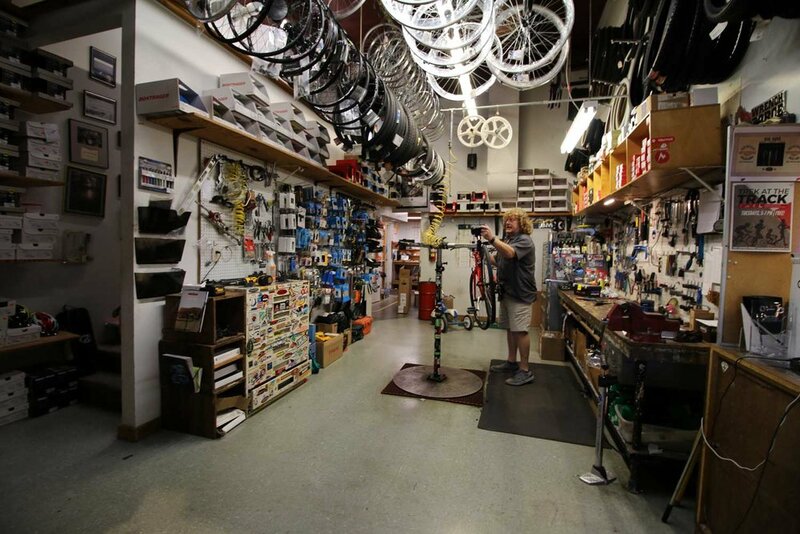 In addition to bicycle sales we have a full service bicycle repair and tune-up shop. Started in 1973, the bike shop has offered the Southern Kentucky area with the most up-to-date models while also providing professional service and repairs. Bicycle Shop general manager Willie Marble tunes up a bike. He’s has been shop with the bicycle shop since 1993! Nat’s carries a wide assortment of bicycles through Trek and Electra. These include: Road Bikes, Mountain Bikes, Lifestyle Bikes, Cruising Bikes, Hybrid Bikes, and more! If we do not have a specific make or model of bike you’re looking for, bicycle shop General Manager, Willie Marble will be happy to consult with you to order one that meets all of your specifications. A custom bike fitted to you. A bike frame guaranteed for the life of the original owner. 10% off all bike car racks for 45 days from purchase date. Bike tune-ups for one (1) year from purchase date. Shop manager Willie Marble has serviced bikes at Nat’s since 1993. He and the rest of the team can perform all major and minor repairs. We carry everything you need to ensure you have a safe and successful trip every time you use your bike. This includes a wide variety of helmets, seats, pumps, clothing, wheels, GPS tracking systems, brakes, components, pedals and much more. We partner with several name brands which include PEARL iZUMi, Bell, Giro, Shimano, Bontrager and more!